According to several reports from users in the past month, some changes have been made by Google. It seems like Google has been testing a new icon in the mobile search results that indicates whether the search result page link is or is not mobile friendly. 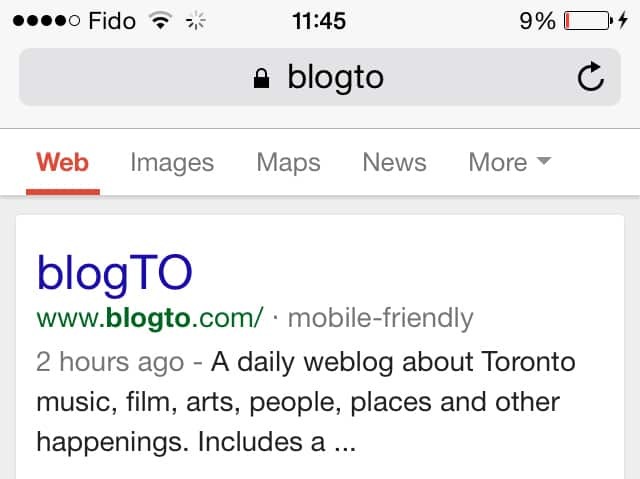 First, Google started with a mobile friendly icon and, a couple of weeks later they introduced reverse one that indicates a non-friendly link. These small, but significant icons are only visible to smartphone users. In addition, users have recently noticed another innovation from Google lab that is slightly different from mobile friendly icon. A gray textual phrase that reads “mobile-friendly” and appears on the right side of the link. Apparently, Google has been trying to improve the mobile search experience. Viewing a non-mobile website could be a frustrating and tiresome process for customers, especially if they are planning to make a purchase. Consequently, viewers might not even give a chance to the non-mobile friendly websites that will probably save their precious time. Users could get frustrated when realizing that the page they ended up with is not mobile friendly. Because of today’s mobile lifestyle, these small improvements are often very helpful. With multi-screen customers in mind, Google has been highly innovative and enabled easier and faster content viewing. Trust Eggs Media – a mobile app development Toronto company that combines innovation with technology. Although the appearance of the small icons gets discontinued, Google was influential with announcing possible future changes. It’s no secret that the mobile friendly icon has caused curiosity from viewers. So, if you want to engage your website viewers and catch their attention, you must focus on the properly created website. It should have all the benefits that would improve your customer’s satisfaction. You can achieve this by the responsive web design or mobile application development. Get in touch with Eggs Media to learn more. 2. Ready for Google Penguin Update?